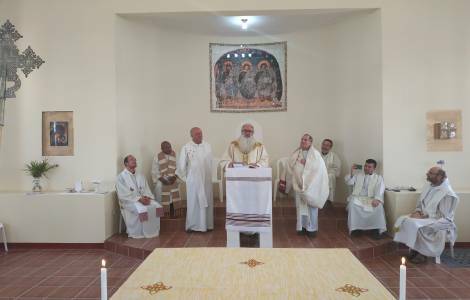 Adaba (Agenzia Fides) - The new church of the Pastoral Center of Adaba, in the Apostolic Prefecture of Robe, Ethiopia, has been named after the Most Holy Trinity. This is what Fr. Giuseppe Ghirelli, fidei donum missionary, responsible for the missionary office of the Apostolic Prefecture, told Agenzia Fides. "The traditional hymn that the pilgrims of the Diocese of Anagni-Alatri (in Italy) sing in the Sanctuary of the Trinity of Vallepietra was sang for the first time in the Church of Adaba in Ethiopia at the end of the celebration for the dedication to the Holy Trinity of the newly built church", he reports. "We came to this choice when in September, the Prefect of the Apostle of Robe, Father Angelo Antolini, Ofm, was with us on a visit to the Shrine of the Holy Trinity of Vallepietra", says Fr. Ghirelli. "For centuries, in Vallepietra, pilgrims have venerated a fresco of the twelfth century portraying the three Divine Persons with the Book in their hands", explains the missionary. "In front of the Sacred Image, Fr. Angelo expressed to Msgr. Alberto Ponzi, Rector of the Sanctuary, the desire to dedicate the new church of the Pastoral Center of Adaba to the 'Holy Trinity' so as to strengthen the link between the two churches, the ancient one of Anagni-Alatri and the young one of Robe", continues Fr. Giuseppe.